Download these 20 must learn riffs to start the year with your guitar. It’s fast, good and it will help you to learn, polish, and improve your guitar skills. The riffs selection is classified by levels: beginner, intermediate and advanced. Enjoy! Feel free to leave a comment if you have any question about these riffs or ideas for upcoming packs of this kind. I just received an e-mail w/ a bunch of free downloads, wanted to say thanks very much – greatly appreciated!!! GP rocks 2018!! I have GP6 and GP7. They are outstanding and very versatile. Thanks for the free licks! Just wanted to say what a waste of time downloading the Free Rock Pack – the files don’t open in GP6: Invalid MusicXML archive. Didn’t anyone check that they worked before uploading them? Great start of the new year ! Thanks ! It doesn’t work in GP6 OSX. GP7 stops to work trying to open unzipped files. What i did wrong? I cannot open these files with Guitar Pro 6 on a Mac. I have no issues with other files, any hints? Thank you. I needed it. Can I open these in GP6? A fantastic beginning of a new year !!! Thanks so much !!! Much appreciated! Happy New Year! Keep up the good work. Thanks but how can I open these .gp files in gp6? I cannot open the “gp” -files” with Guitar Pro 6. What a nice surprise! Thanx alot! GP7 only? Anything for GP6 users? Happy new year, thanks for that! Another challenge for the New Year and free! Thank you and I hope you have a very prosperous New Year! How do I open .gp files? i just cant open it .. any solution? Much appreciated – a nice unexpected bonus, thank you! GP6 users cant have this? It would be nice to provide a version for GP6 users. what do you make for bass guitar players? Downloaded the .gp files. Unable to open with GuitarPro6. How has anyone been able to open these files? Hope everyone finds themselves in good health and has a great 2018. I cannot open with GP6. Is this a GP7 file? Thanks for these. Have unpacked the zip. What program will read .gp files? Sorry, it dosen’t work on GP6, latest MacOS Version….any ideas? Are these files only for Pro 7 ? Awesome! Can we have 20 Crushing Metal Riffs next please? Very cool! would love to see some bass riffs as well, because some of us are bassists (the coolest ones :p). So sad you offer a .GP files for a linux user who can’t open it with Guitar pro 6…. As a long time user of Guitar Pro 6 I find this pretty insulting. Do not send me any “gifts” which I cannot use with the version of software I currently own. Thank you. I’ll have to play that 7-2 stretch on the jack another way though. Which format are downloaded files? New to Guitar Pro… How come I can only see the part & Tab for the first riff in each file ?? Can these be opened with GP6? Thank you for Gifts! Happy New Year! thank you ! happy new year…. tengo el guitar pro 6 pero no encuentro la clave por lo tanto me inpide adquirir el 7 con descuento. por favor si me contestan si puede ser que sea en castellano. How can I oben .gp-files with GP6? That’s pretty lame – having them in the new GP7 format so that you cannot open them with any earlier version. Kinda makes me want to pass on upgrading. 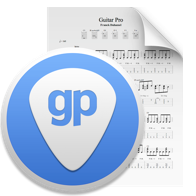 The Guitar Pro 6 version is now available. Hello Al, you can display the standard notation and tab. To do so, in the Track section (panel on the right) > Musical Notation > Notation > press the button to select the notation that you want to display. Thanks fot the GP6 versions of the files!